Chateau / Country House2690 sq. ft.
Poggiarello is a Tuscan country house. The name derives from its unique position on the top of a hill, in a dominant and open position. 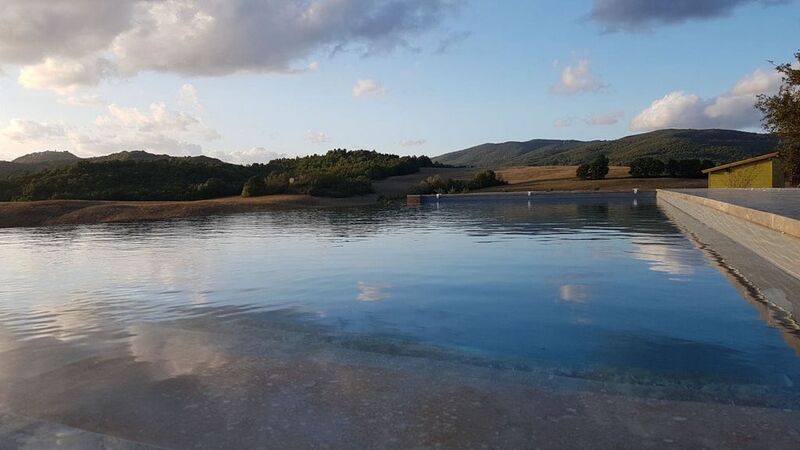 Poggiarello is a place full of peace, where the large oaks and the pond in front of the house, and the private infinity pool offer moments of relaxation. The interiors are furnished with family furniture. Poggiarello has four bedrooms, two doubles and two single rooms with two beds, for a total of 8 beds. the two double bedrooms have a private bathroom, while the singles share an external bathroom. On the top floor, in addition to the bedrooms there is a pleasant lounge with TV. On the ground floor there is the living area with a large bright and comfortable living room, a French bathroom and a large dining room with a table for 10. A rustic kitchen is adjacent to the dining room. The surrounding garden is very large and full of fruit trees. Under the big oaks you can have a snack or you can take aperitifs. In the garden there is also a beautiful farmyard with rustic terracotta flooring and a porch with a comfortable table for dining in the evening and enjoying beautiful sunsets. Nearby you can visit the picturesque and picturesque villages such as Radicondoli, Chiusdino, Belforte. 10 minutes by car you can visit the Abbey of San Galgano which is a summer venue for concerts. At 39 km, 50 minutes by car, is Siena. At an hour and a half the sea of ​​the Tuscan Maremma. The sea, Siena ... In short, a dip in relaxation and in the history of Tuscany! To get there you have to travel 1.5 km of white road. Beautiful house in dreamy surroundings! We had the most amazing holidays in this place. The house is spacious, comfortable, has a lot of character and feels very homely. The views from every side and window of the property are beautiful, typically hilly Tuscany countryside. The pool is perfect, big enough to swim properly, with an amazing view on the hills. Lisa, the owner, is kind, warm and available for any question we had. She even left a bottle of Prosecco for our first evening! We did day trips to Siena, Montepulciano and Florence. We felt at home in this place and were very sad to leave... we'll definitely come back! Vacanza bellissima! Classica casa di campagna ben tenuta, parco immenso, piscina da favola e vista impagabile! La mia bambina a distanza di 10 giorni dal rientro continua a dirmi che vuole vivere lì! Grazie e alla prossima!